Though the country is most easily accessed through Ataturk Airport in Istanbul, Turkey’s capital city is actually Ankara. Both these cities cost around $50 per day, though Turkey’s rural areas often cost less. As winters in Turkey often get as cold as -7˚C (20ºF), summer is the country’s peak tourist season, when temperatures usually rate around 24˚C (75 ºF). Visitors often purchase the world famous Turkish carpets and glassware. Often considered the gateway between Europe, Asia, and the Middle East, Turkey has been an important trade and military route for centuries. In fact, many scholars consider Turkey one of the earliest settled regions in the world, with evidence indicating the area has been continuously inhabited by humans for at least 5000 years. The early period of Turkey’s history, called the ancient Anatolian period, came to an abrupt halt in 334 BCE, when Alexander the Great captured the country. The region would again be captured nearly two centuries later by the Romans. Eventually, the Roman empire fell, and Turkey (particularly the city of Constantinople, now called Istanbul) rose as the central point of the Byzantine empire. At this point in history, Turkey was extremely Hellenized; it wouldn’t be until the arrival of the Ottoman Empire in the late Middle Ages that Turkey would develop the Islamic characteristics that today distinguish it from Europe. Because of several factors, most notably the presence of the Silk Road, the Ottoman Empire became extremely prominent during the 16th and 17th centuries. The Ottoman Empire ultimately dissolved after its defeat in WWI, during which the Turkish government infamously slaughtered over 1.5 million of its Armenian citizens. To this day, Turkey’s government denies the deaths, despite overwhelming historical evidence. Since WWI, the Republic of Turkey has ruled the area, and the country has flourished, particularly since the 1980s. 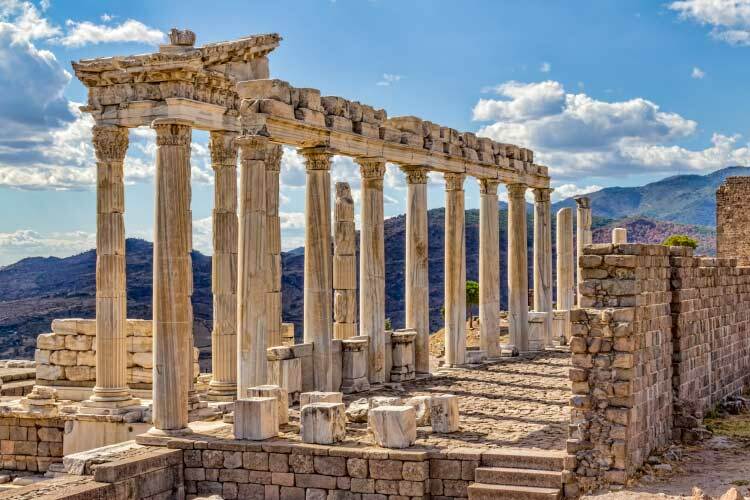 Due to the presence of ancient Anatolian, Greek, Roman, Ottoman, and other civilizations, Turkey is one of the best destinations in the world for historical tourism. Additionally, numerous resorts along the Aegean and Mediterranean coastlines. Though Turkey was once known as the cheap alternative to travel in Europe, today it’s only marginally less expensive. However, this hasn’t stopped tourists from flocking to Turkey’s resorts, spas, and historical oddities, as evidenced by the nearly 32 million visitors Turkey receives per year. This makes it the sixth most visited country in the world. Few would contest Istanbul as Turkey’s most tourist friendly destination. 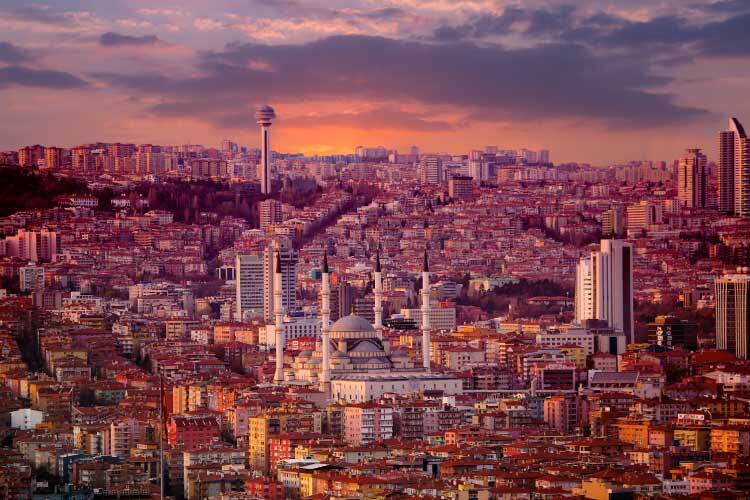 Ever since the days of the Grand Tour, Istanbul has been an important travel destination, and the city has had plenty of time to build up its massive store of hotels, hostels, restaurants, tours, and other travel-oriented services. A great deal of the most famous sights in Istanbul, such as the Hagia Sophia or the Blue Mosque, are of a historical nature. However, Istanbul has recently become known as a fantastic getaway for shopaholics, due primarily to the presence of Istanbul Cevahir, Europe’s largest shopping mall. However, we recommend travelers explore the street markets found throughout Istanbul. Not only do street markets offer better prices on their goods, they also sell more authentic wares. Furthermore, one can be sure there money goes directly into supporting the local economy rather than some faceless multinational corporation. The Turkish Riviera, or the Turquoise Coast as its colloquially known, contains most of Turkey’s coastal resorts and some of its best scenery. The Turkish Riviera features warm weather year round and over a thousand miles of coastline, surrounded by vibrant emerald forests. The landscape of the Turkish Riviera is famously beautiful and has played several important roles in history. For instance, celebrated Roman politician Mark Antony is said to have “given” the Turkish Riviera to Cleopatra as a wedding gift. Additionally, two of the seven ancient wonders of the world used to dot its coastline, the Mausoleum of Maussollos and the Temple of Artemis. Sadly, neither of these two sites stand today. However, visitors can take a “Blue Cruise” down the coast of the Turkish Riviera. These lovely cruises stop at numerous ancient cities, ruins, and otherwise inaccessible beach land. The typical Blue Cruise takes a week, though lengths can vary considerably. Eastern Turkey has historically been known as Cappadocia. While this region was once far off the beaten path of travelers, improvements to Turkey’s infrastructure has allowed the region to flourish, particularly among nature oriented travelers. The unique geology of semi-arid Cappadocia has created numerous scenic geological oddities called hoodoos, which are thin steeples of exposed rock. Cappadocia also features numerous underground dwellings; in fact, several Cappadocian cities developed entirely underground, most notably Derinkuyu. Underground lodging is available for travelers looking for that authentic subterranean experience. 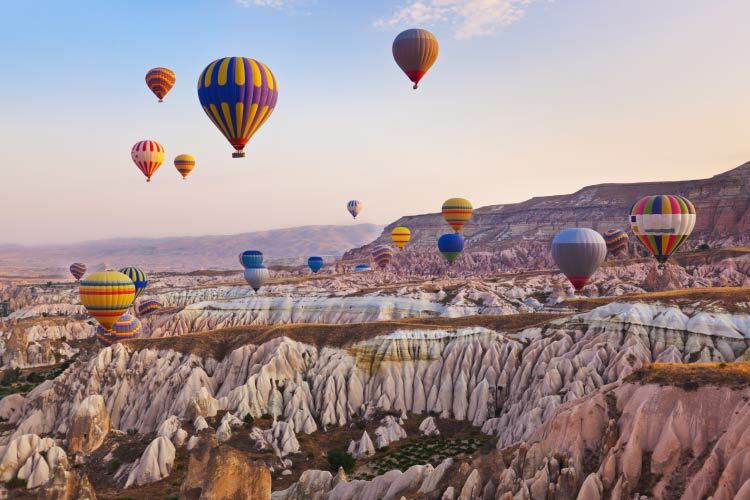 On a completely contrasting note, Cappadocia has also become a worldwide hotspot for hot air ballooning, especially in the areas surrounding Göreme National Park. 1. Begin your trip in Istanbul, Turkey’s cultural centre. Besides enjoying historical sights like the Hagia Sophia or the Grand Bazaar, Istanbul, tourists can also enjoy a series of cruises centred around the Istanbul Straight. 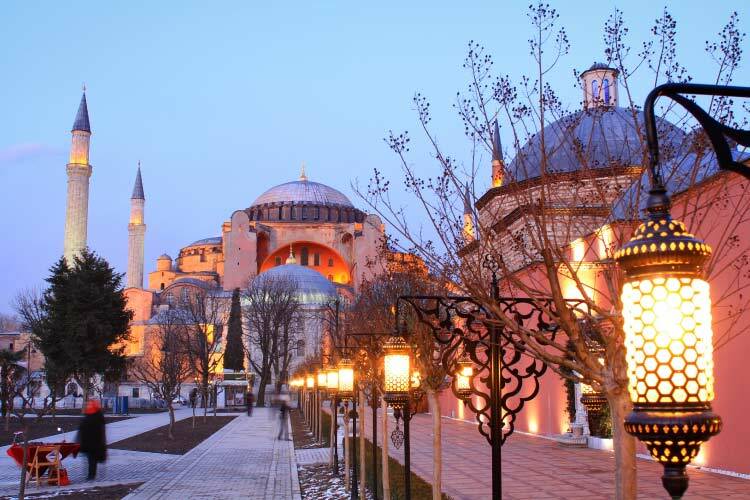 Numerous mosques and churches also populate the city and hold the work of many of Istanbul’s best artisans. 2. Bursa also holds a number of religious and historical sights, though most travelers prefer to spend their time relaxing at Bursa’s many baths and spas. The city also holds numerous street markets. After perusing the local wares, be sure to catch a performance in one of Bursa’s famous shadow theatres. 3. 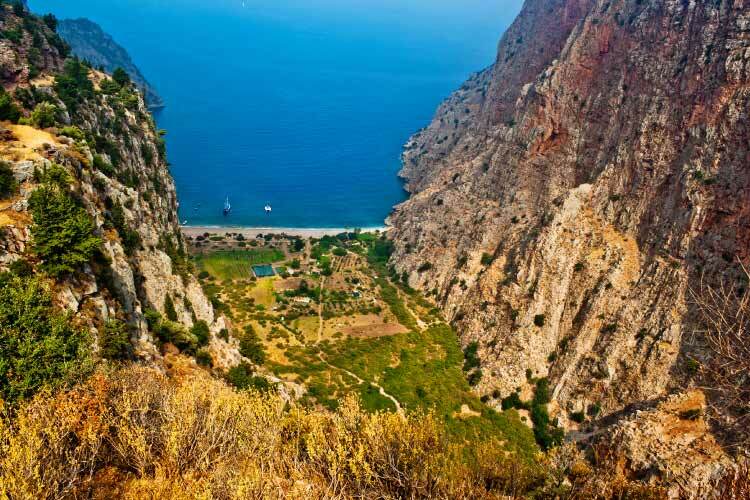 The coastal city of Antalya features much more than miles of gorgeous beach. The city is famous for its outdoors activities, including boating, swimming, and golf. 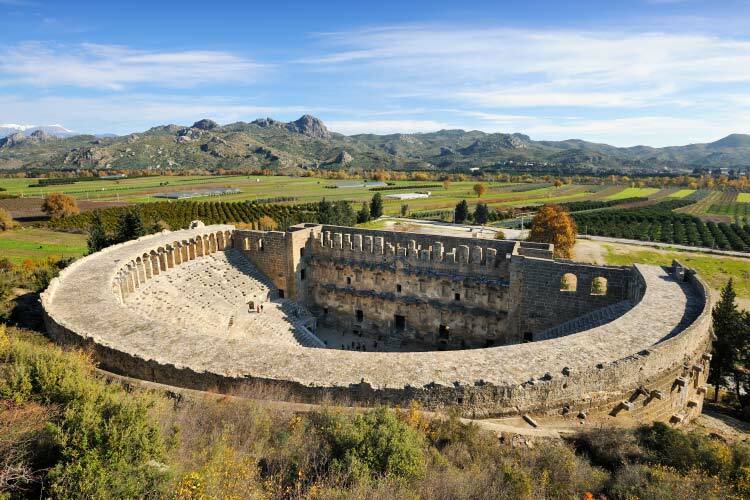 Furthermore, Antalya holds Asia’s oldest theater, the Aspendos. Seeing a play at the Aspendos is truly an experience which transcends time. 4. Known for its stunning architecture, a trip to Konya isn’t complete without ambling down historic Zafer Street. Lined with historical oddities and quaint shops, remember to grab a cup of genuine Turkish coffee before beginning your adventure. Next, visit the Melvana Museum, the final resting place of esteemed thinker Rumi. Ask about participating in the unique “whirling dervish” ceremonies, which are typically free and give a great insight into Konya’s local culture. 5. As Turkey’s capital, it’s not surprising Ankara (pictured below) offers travelers everything from shopping to sightseeing to sports. The historic centre of the city, Ulus, holds most of the Ankara’s attractions, including several museums and ancient bathhouses. Be sure to visit the neighbourhood of Hamamönü. This quaint neighbourhood contains numerous historic homes that have been converted into locally operated shops and eateries. 6. Samsun built its reputation as the largest port on the Black Sea, and even today the city’s maritime traditions are evident in its delectable eateries and selection of museums. After exploring Samsun’s coastline via boat and dining on the day’s fresh catch, one might attend an opera at the beautiful Devlet Opera ve Balesi. 7. The city of Van borders Turkey’s largest lake, Van Golu, so one can expect water sports and fresh food. Kick the day off at one of Van’s famous “breakfast saloons” for a cheap but large breakfast, then head out to explore Ahtamar, an ancient Armenian church. Van also has a very active nightlife, especially in Çarsi, the downtown district.